Where to put a .dylib file that my crystal executable uses? Why p2 is a 'partially linked executable object file'? Since it is called 'partially linked', so it must have done some static linking. But since none of the code or data sections from libvector.so or libc.so are actually copied into the executable p2 at this point. So why p2 is still 'partially linked'? Isn't the static linking is about copying code and data sections from objects files, if there is no copy, then there is no static linking involved? The partially linked executable would have all of the .o object files (here only main.o) linked together, and possibly linking stubs, relocation tables and such to facilitate dynamic linking. The dynamic linker does just the remaining "n %" just before running the program. I think I might have missed something. Really appreciate any help! I'm trying to figure out how to calculate the milliseconds between some socket programming connections in C99 but getting 0 ms on the C99 and returns an actual value on the mac terminal. I included time parts of my code. It seems that I'm missing something fundamental in casting and I don't know what it is! I expected float_to_int_part to be 3 but the output is always 2 which is very confusing. the fact that I don't know why means I'm missing something very basic which could mean I'm missing more basic facts. if someone could tell me what is wrong with my code and suggest a book or a link (that you think will help) to fill this gap. It's more important for me to know what caused the error. if all my variables are float then the output is correct and my module works. Under Windows I downloaded and installed gtk and libxml2 but compiling it says I've not libxml2. I added correctly these two packages to the pkg-config path, but I think I've not the correct libxml2 cause it doesn't contain any .pc, like gtk do. So where can I find the correct installer of libxml2 for Windows? So i went to check the "link.txt" generated in "CMakeFiles" folder, and it contains all the correct path to the opencv directory. I have correct path for all the libraries, yet it still prompt me the undefined reference error. Please advise, thanks. EDIT: Thank you for your comments and replies. My setup is: The random access SPI memory is connected via SPI controller and I use a "standard" driver to access the memory space and store/read data from it. What I wanted to do is to avoid calling the driver's functions explicitly, but to hide them behind some fixed RAM address, so that any read of that address would call the spi read memory driver function and write would call the spi write memory function (the offset of the initial address would be the address of the data in the external memory). I doubt that it is at all possible in the uC without the MMU, but I think it is always worth to ask someone else who might have had similar idea. All the addresses above are within ./ld.so itself, so it crashes during its own initialization. Indeed the control would never reach a.out since ld.so exits. I'm trying to intercept malloc call using LD_PRELOAD. I want to move all memory allocation to shared memory by changing malloc to shm_open followed by mmap. How can I do it? LD_PRELOAD of malloc works fine. I can intercept every malloc call. However, calling shm_open in intercepted malloc fails because shm_open requires linking of librt which links to libdl that dlsym in LD_PRELOAD requires. There is a recursive interposition. I thought about creating a static library of wrapped shared memory allocation. Then call it from intercepted malloc. But librt cannot be linked dynamically. I am trying to create a macOS application using Crystal and libui. I am able to compile a crystal executable with all of the required libraries statically, so it can run on any mac (partially static). For some reason, the shard I am using which is called "hedron" (the crystal bindings for libui), I am unable to compile the program using libui.a, like I am compiling my program with libevent.a and libgc.a. I am only able to build successfully with libui.A.dylib. Even when I copy libui.A.dylib into the ./bin directory, it does not start up on other computers. It starts on mine because I have libui.A.dylib in my /usr/local/lib directory. My end goal is to package this into a .app folder for only macOS distribution. 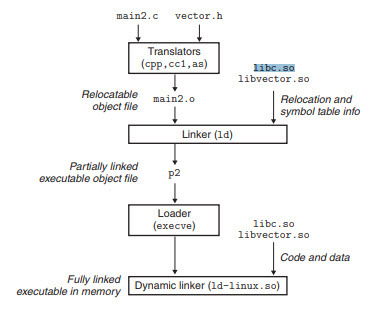 Where should I put the libui.A.dylib so my executable can find it?